This article is about Mario & Sonic at the London 2012 Olympic Games for the Nintendo 3DS. For the Wii version of the game, see Mario & Sonic at the London 2012 Olympic Games (Wii). Mode(s) Single Player, Multiplayer, Wi-Fi, Story Mode, Record Log. Mario & Sonic at the London 2012 Olympic Games is a sports title for the Nintendo 3DS with a Wii version of the game released as well. 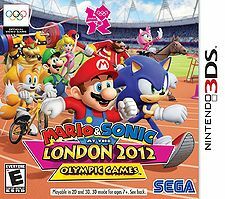 Both games make up the third installment of the Mario & Sonic series, which take place in London, home of the 2012 Summer Olympics. In the 3DS version of the game, there are a total of 20 playable characters (the character roster being identical to the one featured in the Nintendo DS version of Mario & Sonic at the Olympic Winter Games). However, only certain characters can play certain events. These characters are identified in five different classes and get their own storyline. Some characters can compete in other events that they would not normally be playable in Story Mode. It has been requested that this section be rewritten. Reason: This section violates the good writing standards policy. Bowser and Dr. Eggman watch over London from the inside of Elizabeth Tower, but the doctor tells Bowser they're already starting the 2012 Olympics and they haven't got their invitations yet. They believe the other athletes were intimidated and tried to keep them excluded. Bowser suggests that he could use his new machine. Dr. Eggman agrees and puts a mysterious pot in side of it and presses the start button. Then, colorful fog covers all over London. As the referees are prepping everything, a colored fog rolls in. Toad and Omochao end up separated. Toad runs into and is attacked by what appears to be Mario and Sonic while Bowser and Dr. Eggman laugh in victory. The night before the games, Sonic and Tails are exploring London when a strange red fog rolls in. While in the fog, they are confronted by foggy impostors of Mario and Luigi, who try to impede them from investigating by challenging them to an event. Sonic and Tails win and the clones disappear. They later follow Boo and meet King Boo, who challenges them to a Badminton-Doubles event. They defeat them in the event and King Boo and Boo escape while Sonic destroys the machine. Sonic and Tails go off to rest for the night. The next day, Mario and Luigi find Toad, who is apprehensive towards Mario after what he went through with the foggy impostors at the Stadium and find out that the fog is colored blue. They then encounter clones of Sonic and Tails. The latter challenges the former to an event and disappear after their loss. The Mario Bros. rush through the fog. Toad and Omochao find Dry Bowser and Dry Bones and mistake them for the brothers. Fortunately the duo arrive to be challenged to a Sailing 470: Pair event. They then defeat them and the skeletal villains escape the Stadium while the winners destroy the fog machine. Noticing fog in Hyde Park, Toad and bros go to find Princess Peach. At Hyde Park, Daisy and Amy are wandering around and find the impostors of Peach and Blaze. They are challenged to an event where they defeat them. More impostors come and knockout the confused Daisy and Amy. Later on, Peach and Blaze defeat the impostors that attacked their friends and save them. When a purple Toad recalls seeing a white bat in an area nearby, they find the figure to be Rouge. In a strange manner, Rouge challenges Peach to a 100m Backstroke event where the princess defeats her. After her loss, Rouge comes to her senses and has no recollection of what happened. Rouge leads the girls out to the fog machine. Afterwards, Toad, Mario, and Luigi arrive to see they are okay. Rouge recalls breathing in the fog and that someone told her to trap them in it. She recalls it was at the British Museum and the being was Eggman. The five females stay behind while Mario and Luigi go with Toad to the museum. After last night, Sonic and Tails discover more fog at the London Bridge. They encounter Yoshi and try to help him out. Then, Shadow and Silver impostors appear. Agitated by their behavior, Yoshi challenges them to an event. After Yoshi defeats them, they disappear and the real Shadow and Silver appear. Then, somebody comes speeding past with the three hedgehogs in pursuit. The speedster turns out to be Jet the Hawk. After rudely declining to help them and attempting to take the hidden machine, Shadow challenges him to a 3,000m Steeplechase match. After being defeated, Jet promises to help out when they discover the machine. He tries to break it until they hear Bowser's voice. Bowser Jr. reveals himself next to the machine and that he was the one doing his father's voice by taking a breath of the fog. After he's downgraded for habit of living in his father's shadow, Junior challenges the other three Challengers to an event, promising to tell them where Bowser is when they win. After he's beaten and Shadow destroys the machine, Bowser Jr. breaks his word and leaves after slipping out Bowser and Eggman's alliance. While Yoshi chases him down, Shadow suggests they split up to comb different areas; with Sonic and Tails taking the British Museum. At the British Museum, Mario, Luigi, Toad, Sonic, and Tails meet up. The heroes then find returning impostors of themselves and beat them in an event. After more searching, they discover Dr. Eggman Nega after Toad bumps into him and challenge him and his Shy Guys to a 4x100m Relay where he is defeated. He then disappears while Mario and Sonic destroy the machine he was guarding. They then search the museum for sources about the fog where they discover that it's called the Phantasmal Fog and was stolen by the legendary pirate, William Kidd 300 years ago. Espio the Chameleon appears and tells them Bowser and Eggman are still causing trouble at different venues. Charmy Bee directs them all in different directions. Sonic goes solo while the other heroes pair up with the referees. At the Wrestling Stadium, Donkey Kong has finished a workout and was about to enjoy a banana, when Espio and Tails meet him to warn about the rampage of E-123 Omega. The robot arrives and crashes into him. Shaking this off, Donkey Kong is uninterested in Omega's challenge at first, but reconsiders when he realizes Omega had ruined his banana. They do a Wrestling-Freestyle Match where DK wins. Tails discovers that Eggman had put a chip in him that caused him to go rampant. Omega reactivates and forgets everything that happened, but apologizes to DK. He promises to help out and he goes with Espio and Tails. Later on, Sonic arrives at the Volleyball court and narrowly dodges an ambush by Bowser. Knuckles and Vector arrive and explain Amy asked them to check out the area. They challenges the Koopa King to an event. They defeat and corner him and Knuckles crushes his machine. Sonic moves on while his powerhouse friends interrogate Bowser. At the Tennis Court, Waluigi is looking for a spot to spy on Luigi and learn his weaknesses until Metal Sonic comes along and breaks his telescope. Angered, Waluigi accepts a challenge from Metal Sonic and defeats him. The robot runs away and Waluigi follows him; oblivious to his witnesses, Luigi and Charmy. Meanwhile, Wario is planning to make an Un-Discount Snack Emporium, but a fog machine is in the way. He then tries to disable it, only to be confronted by Dr. Eggman. The rounded men do a match which Wario wins. Dr. Eggman, unfazed, lets Wario try to destroy his machine. Wario prepares to only realizes he made himself dizzy because the machine was only a hologram. Eggman escapes while a vexed Wario recovers and follows after him into the fog with Mario and Toad behind him. Waluigi and Wario meet up and confront the scientist and his creation while Mario, Luigi, Toad, and Charmy sneak up on them and see what they are doing. Dr. Eggman and Metal Sonic challenge Wario and Waluigi to a match where Wario and Waluigi win. Wario destroys the real and final machine as Eggman and Metal Sonic collapse in defeat. Mario, Luigi, Toad, and Charmy congratulate them as they move on while the Wario and Waluigi volunteer to keep an eye on the villains, intending to resolve their unfinished business. The heroes get together again at the main stadium, and tell each other that all the fog machines were destroyed, with help from members of the Tricksters and Wild Ones. Everyone rejoices because the opening ceremony can continue. Back at the wrestling stadium, Knuckles backs Bowser into a corner and punches him, only to reveal it is a fake, much to his and Vector's confusion. The same situation happens when Wario and Waluigi corner Dr. Eggman, who suddenly disappears as well, much to their dismay. In Big Ben, Dr. Eggman and Bowser are happy that they have everyone fooled. The doctor then goes to his machine and resolves to cover London in fog again, but with ten times the strength. Bowser agrees with this plan. After pressing the button, fog spreads very quickly throughout the room. The top of the machine breaks and more fog spews out rapidly. It surrounds Bowser and Dr. Eggman, who feel power welling up within them. The two evil doers laugh as lots of rainbow fog spews from the Big Ben. After the united heroes save Cream the Rabbit from more of their foggy clones, Omega recalls something at Stonehenge. At Stonehenge, they and Toad hear Magikoopa's voice as he challenges Sonic to a BMX match. The blue hedgehog defeats him causing the sneaky wizard to run away after flinging Omega into Big the Cat. Omega recalls that when he was corrupted, he was asked to transport the urn containing the fog to Eggman's lair at Big Ben. After finding the seal, they head over there. After defeating more clones, the heroes advance to the lair while Omega and a weakened Toad head back to the stadium. At the Factory, Mario, Luigi, Sonic, and Tails arrive to defeat Bowser and Eggman only to find they are greatly powered by the Phantasmal Fog dwelling in them. Toad then uses the radio communicator to talk to Tails and tells him that everywhere else is cleared up thanks to the other athletes, opponents, and referees and the Olympic Games are up to them. The quartet face the powered-up Bowser and Eggman and defeat them. While Luigi and Tails hold the villains off, Mario and Sonic destroy the machine and seal the fog in the urn. Disappointed, Bowser and Eggman complain how they will never be in the Olympics. Toad says that their names are on the competitor list. While wondering why they have not gotten their invitations yet, Toad explains they can bring their ID. The two villains are exasperated at this misunderstanding and realize they do not have their ID's but Tails says Mario and Sonic can vouch for the sheepish pair. At the Opening Ceremony, Bowser and Eggman are at the front watching Mario and Sonic present the Olympic Games. Bowser Jr. arrives in England to compete in the games. Unfortunately, he took a wrong turn and ended up in Stonehenge instead of London. After being informed by Shy Guys, he sees Yoshi training for the games and challenges him to an Olympic event. Junior wins and calls on his Bullet Bill to bring him to London. Later, Omochao and a regular Chao are being threatened by two of Dr. Eggman's robots for unknown reasons. Shadow and Silver arrive to defeat them, but Junior, flying overhead, accidentally falls off of his Bullet Bill and destroys both robots by landing on them. The two Chao are grateful and the two hedgehogs are impressed. Wanting to see how strong he really is, they challenge Jr. to a 2-on-1 Olympic event, which Jr. wins. Shadow and Silver are good sports and congratulate the young Koopa. A nearby Goomba convinces Jr. to look for more robots so that he'll be even stronger. Arriving at the stadium, Junior and the Goomba see Dr. Eggman measuring Metal Sonic's time running around the track. Junior challenges Metal Sonic to an event. Thinking this would be perfect practice for the robot, Eggman agrees, on the condition that Junior becomes in debt if he loses. Junior accepts, telling Eggman that if he wins, he has to tell his father of his victory. With that, the child and robot set off. Jr. eventually wins. Eggman tries to examine Junior to see what he needs to do to upgrade Metal Sonic, but Junior angrily stops him, demanding a drink and snack in exchange for Eggman trying to con him. The scientist reluctantly agrees. Bowser angrily stomps through London, followed by Goomba, Lakitu, and Magikoopa. His minions state wrong facts to him. Magikoopa, believing he's still upset over what happened in Vancouver, offers to use his magic to keep Mario and his friends out of the games, but this just agitates Bowser further. The minions decide to cheer him up by secretly letting him win some Olympic events against the other Wild Ones the next day. Their first target is Donkey Kong. Magikoopa promises a pile of bananas in exchange for taking Bowser on in an event, but when the ape agrees, the wizard summons a Thwomp to fall on DK, making him dizzy and less likely to win. Bowser arrives and wins against DK. Behind his back, however, Magikoopa makes it up to DK by getting him the bananas that were promised. Later, the Magikoopa, as well as the Lakitu and a Dry Bones, somehow convince Knuckles and Vector to rendezvous. To convince them to fight, the Magikoopa uses his magic to make the Lakitu and Dry Bones to look like Charmy and Espio, respectively. The powerhouse duo notice the two fake members acting funny, but agree to fight Bowser. The Magikoopa then summons giant versions of a Chain Chomp and Piranha Plant to bite Knuckles and Vector, respectively. Similar to DK, this makes the two dazed and less likely to win. After Bowser defeats them, the Goomba (who had led Bowser to the arena) quickly escorts him out before Knuckles and Vector, held back back by the still disguised Lakitu and Dry Bones, ask too many questions. For Bowser's last false victory, the minions plan to make Mario lose in a tennis game. Unfortunately, Boo failed to trick Mario into coming to the court because Mario was too smart to be tricked and he saw through the plan. After the other minions come, Dry Bones distracts Bowser while the other minions think of a plan. The Magikoopa decides he'll have to transform one of them into Mario. Dry Bones can't do it because he is talking to Bowser and only speaks in "clacks", neither Boo or Lakitu can do it because they float, and they can't bring in a Shy Guy. Goomba is terrified to pretend to be Mario, but agrees when Bowser's patience is wearing thin. Bowser challenges "Mario" to a game of tennis and wins. After the match, Bowser Jr. arrives and is happy that his father won and says he wants to be just like him, while the minions celebrate over the success of their plan. Bowser notices that his minions are finally satisfied that he is back to his old self, as it turned out he had a toothache. In his secret headquarters inside Big Ben, Eggman defeats Metal Sonic in a match of Taekwondo. He is unsure of what to do to upgrade his creation. His other robot minions, Orbot and Cubot, see Waluigi on the monitors and suggest him for practice. They confront Waluigi and convince him to battle, saying it would make good practice for defeating Luigi in the Olympics. Metal Sonic wins with Eggman deducing that Metal Sonic possesses speed, but not strength. The robots come across Wario and ask him to challenge Metal Sonic so that the robot may go against Wario's strength. However, defeating Mario isn't good enough for Wario, so he and Eggman settle on a bet: if Wario wins, Orbot and Cubot come work for him; if Metal Sonic wins, Wario has to give Eggman something of his. Metal Sonic emerges victorious, so Wario gives Eggman an old urn he got from an antique shop, claiming that it is magic. Eggman seems to recognize it and accepts it. Back in his headquarters, Eggman places the urn inside a machine. The machine slightly unseals the lid on the urn and gray fog pours into the room. Some of this fog takes the shape of Sonic and Eggman challenges it to an event. Eggman appears victorious and the Sonic impostor vanishes into thin air. Eggman explains to his minions that this urn contains the legendary Phantasmal Fog, stolen 300 years ago by the legendary pirate William Kidd. The urn eventually ended up in the British Museum, where it was recently stolen. He says the fog shapes into whoever the person in it is thinking about, explaining the impostors in the main story. Eggman resolves to completely unseal the urn after he and Metal Sonic are done training for the Olympics. At Hyde Park Peach, Amy, Blaze, and three Toads are setting up the invitations for all of the athletes, however Amy suggests she take Sonic's invitation to him personally but the others don't want Amy to go and insist that she stay and help the others work. However, after more begging, Blaze suggests that if Amy can beat her in a competition she will let her go. Then, after Amy beats her, Blaze accidentally scatters the invitations. Amy then decides to stay. Later, Daisy shows up and talks about going shopping. Amy wants to go with her. Peach challenges Daisy and says if she wins, Daisy must stay and help. If Daisy wins, Amy can go with her. After Peach wins, they all go out for a break. But when they return, the wind had knocked off all of the invitations to the ground. After they pick them all up they realize that they are missing Bowser's and Eggman's invitations, so they make new, detailed better ones. Later, Peach and Amy meet Bowser and Eggman in the park and end up playing a round of Beach Volleyball. After they win, they go fetch their invitations, but at the same moment the Toads go to deliver them and they drop Eggman and Bowser's next to them. Bowser and Eggman look at how well it's written and think that the pink girls were writing love letters to Sonic and Mario. Confiscating them, Bowser and Eggman go off together looking around London before they do something evil. The girls assume that Bowser and Eggman took their invitations themselves, so they all decide to go out shopping together before the Olympic Games start. The last part states after sightseeing, Bowser and Eggman forget about the invites. The fourth wall is broken when it says that the player is the only one who fully understands the misunderstanding that led Bowser and Doctor Eggman to fog up London. There are two ways to play the Olympic Mode. Each mode allows up to 4 players. This is more like the Single Match mode in the Wii version of the game. 4 players compete or co-operate in an event that is selected by the host. After selecting an event and the difficulty of the computers (COM Level), each player chooses 1 character to use from one predetermined category of the 5 total (Heroes, Girls, Wild Ones, Tricksters & Challengers). The players play the event according to its rules. After an event, a medal is given to the player as long as the player doesn't get 4th place. If two or more players/teams tie for a position, the same medals are given, unlike the other handheld titles. After an event, the player can choose to play the same event, change the event or quit the game (this is shown as Disconnect in case of multiplayer). The seeding is determined randomly, and one player plays against the other player in their pair. After the semifinals have ended, the winners play against each other for 1st and 2nd place and the losers play against each other for 3rd and 4th place. Note that the players will not see who will duel up against until the semifinals have started. To ensure that there are always 4 teams in an event, extra COM-controlled teams are added based off how many players are on a team. With 2 members per team - There are 2 extra COM-controlled teams. The first COM-controlled team are a team of Koopas while the second COM-controlled team are a team of Chao. The extra COM-controlled teams do not appear in any event. In case of tournament-based matches, the extra COM-controlled teams will always lose the semifinals. In the case of Sailing - 470 (Pair), the extra COM-controlled teams will always place 3rd and 4th. With 4 members per team - All 4 characters from that group compete against the 3 COM-controlled teams that are all Shy Guys of a specific color relating to their team number. The COM-controlled teams of Shy Guy only appear in the 4 x 100m Relay event. Somewhat similar to the "Multi-Round Match" mode of the previous installment, 4 players play a predetermined number of events to try to get the highest score they can. Upon creating a new file, the player does the Warm-Up Medley consisting of 3 events (100m > 100m Freestyle > Judo). Records set during this medley do not count, and the player cannot see the results of the events. Standard allows players to specify their preferred characters in each of the 5 groups before the events and offers instructions and results for the events. In the Quick type, it skips the instructions, character selection and interim results screen. The player can view only their current position and point total during an event. Within a Medley Match, the player can choose medleys from London Games, preset selections of events based on event type; Variety, preset selections of events based on theme; Party Mix, a mode with a set of possibly random events hosted by Omochao, with other random modifier events; and Custom, the player's own selection of events. A Recommended Medley is also offered. Frequency: Determined by how many times the player has played the event. In the Play Data section of the Record Log, the player can check which 5 events the player has played the most. Difficulty: The average level of COM opponents of all the player's plays in the event. This attribute will change even if the player cannot compete against a COM player or team because of the number of players and/or the selected event. Performance: The average finishing position of all the player's plays in an event. The three attributes determines the "hidden score" for the event. This is compared to the other 56 events and determines the rank for that event. By picking events where the player is very good at or has been practicing a lot (whose Best Event Ranking is close to or at 1), the rating increases. On the flip side, selecting events where the player is not very good at or has very little practice at (whose Best Event Ranking is close to or at 57) will lower this rating. When each event in the medley are all in the top 3 or top 5 of the player's best events, the rating given will be 10 stars. When playing multiplayer, the medleys available in the Custom list are based off medleys in the host's list, and only the host can win a badge for winning a custom medley with a certain rarity rating - a win by P2, P3 or P4 does not yield a badge for that player. The Rarity Rating does not change once a medley is created - the player must delete the medley, create another one and select the same 3 or 5 events on that medley to determine if the Rarity Rating has changed. Do note that the COM Level setting does not affect whether a badge will be won for winning a custom medley with a specific rarity rating. Medley Mania uses a points system to determine the champion. The point structure is usually 10 points for 1st, 6 points for 2nd, 4 points for 3rd and 2 points for 4th, but certain conditions can change the amount of points a player/team can earn. In addition, some events play differently than in Highlight Match mode (e.g. in Keirin, players lower in rank during the medley start further ahead of the pack and the point distribution is 15-10-5-0 from 1st to 4th). After all the events, the player/team with the highest point total is the winner. A check is given in the Select Medley for the appropriate difficulty level (and easier ones) for each medley that the player finishes in 1st place. Local Play and Download Play are both offered for 2 to 4 players. In Local Play, the player can play a single "Highlight Match" with other players or a "Medley Match". Records set during local play (including events that are co-op events) are saved. Unlike previous Mario & Sonic games on DS, there are some limitations to Download Play. In Download Play, the player can play any event in a Highlight Match with character selection, or a limited version of Medley Match called "Party Mix Demo DL Medley" where everyone plays as colored Yoshis, regardless of the events chosen. In addition, the announcer and the characters don't talk on systems that are playing via Download Play. Some features are also disabled and also, the Top Screen is fully white when selecting an event or a character. Furthermore, players using Download Play cannot save their data, and when playing Download Play, there is different music for certain areas of the game. Different things can happen depending on the selected event and the amount of players that are participating. When playing in multiplayer, each player may team up for an event depending on which event is selected. The controls in an event may be different in co-op than in single player. When only 2 players are connected, the human players automatically go to the Finals in case of tournament-based events. 2 Player - The players will always pair up against the COM. 3 Player / 4 Player - Each player selects a character. After that, the host selects the team that each player will be on. If there are 3 players, the character that is not selected by either of the players will join the team of the single player. If there are 4 players, each player selects a character. The order of the characters is P1 > P2 > P3 > P4. If there are less than 4 players and the COM can control some characters of the user-controlled team, each player selects one character. The COM will control the characters that were not selected by the other players in certain events. This also applies in Single Player mode. 1 Player - The player will not select a character. Instead, the order of the characters in the Select Character screen will be the order of characters in the event. 2 Player - Both players each select 2 characters. P1 will control the first and third characters while P2 controls the the second and fourth characters. 3 Player - P2 and P3 both select a character, with P1 selecting 2 characters. P1 will control the first and fourth characters, P2 controls the second and P3 controls the third. On March 1, 2012, a demo of the 3DS version of the game was released on the Nintendo eShop. Five events are playable in the demo: 25m Rapid Fire Pistol, Football, Trampoline, 50m Backstroke and BMX. The player cannot choose his or her character or name, as that is always M&S. Each event is played using one of four characters, and each set of characters in an event belongs to a particular class. The 25m Rapid Fire Pistol uses the Tricksters class, the Football event uses the Wild Ones class, the Trampoline event uses the Challengers class, the 100m Backstroke event uses the Girls class, and the BMX event uses the Heroes class. The demo can be launched a maximum of 30 (20 in Europe) times once downloaded. Nintendo 3DS Richard George, IGN 6.5/10 "Perhaps that's what makes Mario & Sonic at the London 2012 Olympic Games on the 3DS so frustrating. While it has some great mini-games, it forcefully limits itself and discards many of the ideas that made its predecessors so good. There are some good elements here though. Acquiring medals, ranking your best scores globally and earning medals can be very addicting. But only half of these games are worth playing. Most are simply shallow attempts at their counterparts, which is more or less what this version of the London Olympic Games ends up being." Nintendo 3DS Shane Jury, Cubed3 8/10 "Mario and Sonic’s sporting antics make for an enjoyable 3DS debut that radiates character and graphical prowess, together with a wide array of varying competitive events and versatile methods of play, though a weaker multiplayer offering ensures a Silver Medal for Mario & Sonic at the London 2012 Olympic Games’ long-range appeal." For this subject's image gallery, see Gallery:Mario & Sonic at the London 2012 Olympic Games. Paper Mario series - The HP replenish sound is used for a Skill character's special move in Badminton and Beach Volleyball. Mario & Sonic at the Olympic Winter Games - All the Mario franchise and Sonic series songs return as well as the rival themes. In story mode on the 3DS version, Toad, Magikoopa, and Silver reference the story mode of this game. WarioWare series - Wario mentions the name of his company in the story mode. Mario & Sonic at the London 2012 Olympic Games - The game's theme, as heard in the E3 2011 trailer. Mario & Sonic at the London 2012 Olympic Games - The game's theme, as heard in the intro. This is the first Mario & Sonic game to feature the new Sonic voice actors, with the exception of Dr. Eggman, who kept his voice actor. This is also the first Mario & Sonic game to feature Bowser's current voice, Kenneth W. James. At the beginning of the Story Mode, Bowser actually refers to himself by his last name, "Koopa." The 4th place music from the Wii version of the game plays if the player places 3rd. This is because there is a different music piece for finishing 4th. This is the only Nintendo 3DS title in which the in-game font is taken from Super Mario Galaxy. This page was last edited on April 4, 2019, at 18:05.